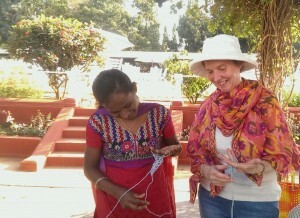 Jacqui teaches a former street child how to finger knit. The children’s homes support 60 former street children, all of whom can now finger knit! Our second Knit for Peace holiday, run by the delightful Debbie Bliss and hosted by the Green Hotel, was a roaring success. The perfect climate for a mid-winter escape, our only complaint was that we didn’t want to leave! The award winning garden and immaculate palace rooms at the Hotel provided a constant source of inspiration for our Indian motifs, whilst the food and drink was absolutely delectable. After a morning knitting Indian-inspired squares under Debbie’s guidance and in the shade of the veranda, each afternoon offered a chance to visit local charitable projects, browse and be inspired by Mysore’s markets, see a palace or a temple and inevitably, knit more! We also took the opportunity to take 800 jumpers and hats knitted by volunteers in the UK to be distributed by our charity partners in India. Visiting local charitable projects was a highlight for many of the group. One of the projects even visited us! After treating us to a display of their dancing skills, it was time for us to show the 60 visiting former street children how to finger knit. A jolly afternoon was had all round, making a highlight of the week for some knitters. Spurred on by all the positive feedback we have had from our knitters, Knit for Peace is organising more knitting holidays in interesting places for 2015. In April we are going to be holding a Knitting Medley at the University Women’s Club in the heart of London’s Mayfair. If you’re thinking of coming on holiday with us later this year, we would love you come along to the Medley and get a feel for the friendly, inclusive atmosphere that characterises our holidays. You can just join us for a day if you’re a local, or there are rooms at the Club for those coming from further afield. 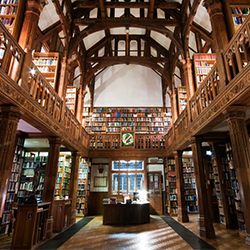 For a slightly longer break, we’re heading off to knit with Debbie Bliss in the glorious surroundings at Gladstone’s Library for 3 nights in June (5th – 8th). The venue is both tranquil and inspiring – and as well as knitting in the wonderful garden (weather permitting! ), a visit to nearby Chester is planned. Continuing our theme of unique and interesting venues in which to knit and from which to explore, we invite you to join us at Loharu House, the ancestral home of the Nawab of Loharu, in Jaipur this October (16th – 27th). With Erika Knight leading the course and a day trip planned to the Taj Mahal, this is one not to miss! Watch this space for more details. All profits from Knit for Peace holidays fund our charitable work at home and abroad.